barska has no other items for sale. BINOCULARS LENS COATING: MULTI-COATED Weight: 41.6oz. Capture beautiful landscapes or keep a watch on your invaders with the Barska Optics Gladiator AB10762 binoculars. The BK-7 prism glass of these Barska zoom binoculars provides crystal clear view. The fully coated lens of these Barska binoculars prevents scratches and adds up to the durability factor. The 10mm eye relief of these Barska zoom binoculars lets you use the equipment even with your spectacles on. Furthermore, the larger lens of these Barska binoculars increases the light transmission. Use the variable magnification of the Barska Optics Gladiator AB10762 binoculars to zoom in or zoom out and view your subjects in a realistic frame. There are 1,086 items available. Please enter a number less than or equal to 1,086. We accept payment by PayPal and eBay approved methods only. I didn't want to pay $200 or even $150 for a good binocular so I took a chance on these and am very pleasantly surprised with the quality and how well they work!! You cant find a name brand company for this price range at all. These focus extremely well and with a zoom of 8-24x you just cant beat these, unless mabey you do want to spend $150.00 and up!! Love them. A little on the heavy side but I think that's just better construction for durability and longevity. 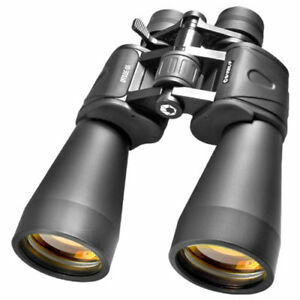 The Barska-10-30X60 Gladiator Zoom Binoculars AB10762 look to good to be true. They came with a crack in the outer frame. I couldn't adjust to get rid of a double image. Would have returned but going to use as a spotting scope so only need one side to work at a time. Not the first time Barska brand let me down. better than just 10x50's, cause of the large aperture. the plastic is cheap though, so when operating the zoom or resting the eyepiece against your eye, the barrels noticably move in and out at different distances, maybe a quarter inch or more. Definitely won't stay in focus when operating the zoom, and not at all at 20-30 power. So I'd like better quality & not buy barska again. though at 42$, as opposed to many hundreds, maybe worth it. I'm using them. this is a good deal, get them you wont be sorry.replaced a pair i had from sears for 40yrs that were done. love them. awesome pair i bought some on sale and they work amazing for that price, ruby lens brings out a more brighter look compared to the convention lenses and 60mm provides a big viewing while zoom lets you get up close and personal gtreat for long viewing and taking for a hike in the mountains just a little heavy but durable. But they are no good for birding.